Here’s good news for Precision Rifle Series (PRS) competitors. Tikka will offer a new, modular T3-based Precision Rifle for the PRS Production Rifle Class. This new, sub-$2000 Precision Rifle is a joint project between Beretta U.S.A. and McRees Precision. Tikka’s new, limited edition TSR-1 Precision Rifle combines the barrel and action of the Tikka T3 Compact Tactical Rifle with a modular aluminum chassis from McRees Precision. 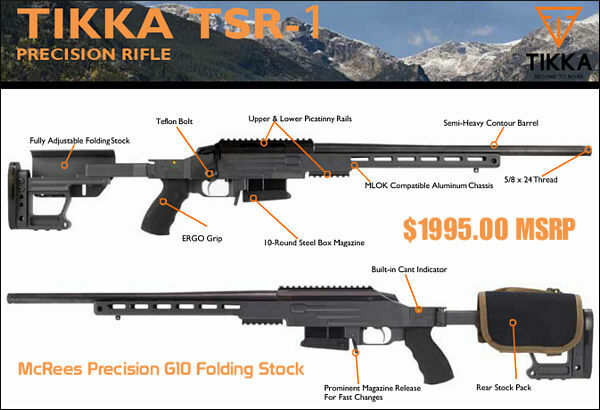 Tikka TSR-1 production will be limited to 400 pieces and will have a $1995.00 MSRP. Initially, chamberings will be .260 Remington or .308 Winchester. According to RecoilWeb.com: “The TSR-1 features a McRee’s Precision G10 folding rifle stock with an M-LOK compatible fore end, adjustable LOP and cheek riser, McRee’s M-LEV integrated cant indicator, upper and lower Picatinny rails, QD sling swivel sockets, and a sniper grey Cerakote finish.” The T3 action is fitted with a +20 MOA Mountain Tactical Scope rail, and the barrel comes with a 5/8×24 threaded muzzle. Beretta even includes one of McRee’s Rear Stock Packs. 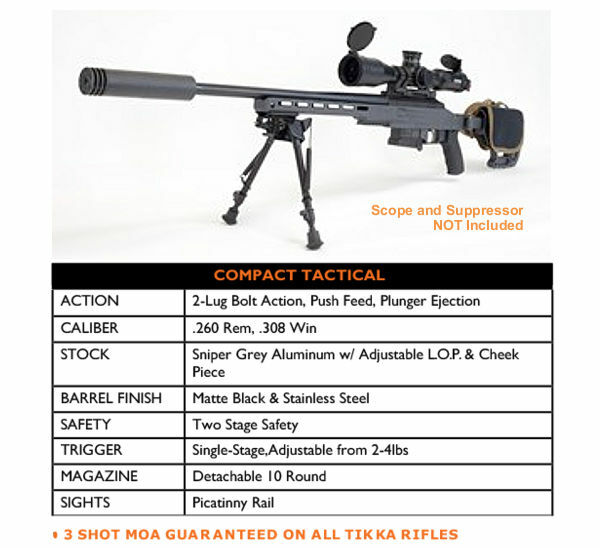 Share the post "New Tikka TSR-1 Precision Rifle for PRS Competition"
Who will be selling this? They should import more T3 Sporters instead! What is the supposed utility of that lower picatinny? TikkaPerformance.net claims to have them in stock. You could also save yourself $200 and be able to use AICS mags if you buy a Tikka CTR and the McRee chassis separatly. You could also recoup some money in selling off the original magazine. I purchased the bronze Cerakote version in .308 with stainless steel barrel. I am by no means a master marksman but I can probably shoot 1/2″ MOA with the gun. It’s also my understanding that of the 400 produced only 50 were in the bronze finish. I love the gun.